Kids science fair projects should begin with students brainstorming a number of science fair ideas they might like to do for a project. Their ideas should also be ones that can be tested and duplicated by others. They should also start a log (notebook) at the very beginning with notes about their ideas, where they obtained their information, and pictures they have taken of their project. Kids science fair projects should begin with this important step. The problem can be in the form of a question. Which product is the best detergent to clean grass stains off white socks a, b, or c? The problem could also be some that needs to be invented. 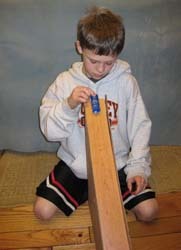 Children in wheelchairs have trouble picking up small toys. The problem might be What could wheelchair bound children use to pick up small toys? Research for answers to the problem on the web, in books, newspapers or magazines. After conducting your research, come up with an answer to the problem in the form of an hypothesis. The hypothesis is your educated guess as to the answer to the problem. Kids science fair projects that have good hypothesis are more likely to be winning projects. The list of materials is simply what you used to conduct your research. You need to keep this information in your log. Write down the exact steps you follow as you test your hypothesis. Remember to have only 1 variable. For instance, if you were testing the different detergents to remove grass stains you might have the socks, water and amount of detergent exactly the same for each test. Only the brand is different in each test. You should test the different brands 4 or 5 times to see if the results are the same. Since this might become a little expensive doing it with socks you might change it to squares of cotton instead. A yard of cotton cloth would be much less expensive than a dozen cotton socks. Create a data table that shows the results of the tests you conducted. Science fair judges like to see data tables on the display boards. After creating a data table write up the analysis of your testing. Write down how the three products compared when you averaged out the results of the tests, etc. Sometimes your hypothesis is incorrect. That is OK. Just write it up and explain what you think went wrong and how you could correct it in future experiments. Kids science fair projects should always contain a log book of what students did during their project. Rewrite everything you have in your log book on a computer and put it in a 3-ring notebook. Print up the pictures you took on the project. Your materials should contain everything you have written about your project and handed in to your teacher also. You can punch holes into your papers and put them in the notebook. Another option is to use plastic sleeves that will hold pages and pictures without damaging them. Look for plastic sleeves in places like Office Depot, Office Max or Staples. Create your display. Put all your information on a display board showing everything you did during your project. Be sure and place the name of your project at the top of the board in the center so it is easy to read. Small models or samples of what you did add to your display. Practice what you will say to the science fair judges. At school science fair judging contests you may have only 5 minutes to explain your project. If you attend regional and national science fairs the presentation time can easily be 15 minutes or more. Jumping Model Cars for Distance See what two six grade boys did for their science project. Easy Science Experiments Turn one of these fun and easy science experiments into a science fair project. Kids Science home page Return to our home page for a list of all the fun, interesting and amazing science topics found on this free website.